Ahoy! 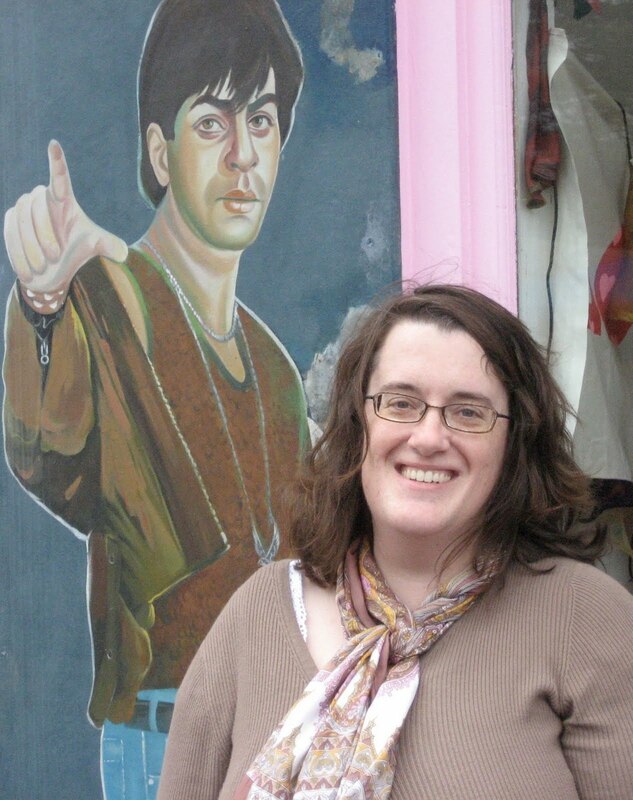 What a shamefully quiet month it's been on Beth Loves Bollywood! 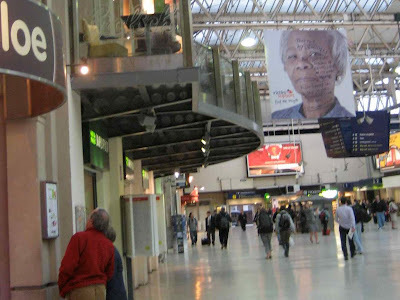 What happened was this: I went to Europe for three weeks, and before I left I had plans to write two posts that would go up in my absence, but Blogger wasn't behaving, so that didn't work. I did have many, many Bolly-related adventures, some of which may get written up at a later date. Dinner and Rajneeti with The Buddha Smiled. Quite difficult to decide whether TBS or Ranbir is more charming. If I recall correctly, we both liked the film very much, and I also vouch for TBS as a delightful viewing companion who contributes just the right amount of humorous and/or interesting comments and adds thoughtful commentary to important issues like whether Katrina Kaif's Hindi has improved (his verdict: yes). A stop by the wonderful fair trade shop Ganesha for chatting and Bolly gossip and later some dinner with the owner and her friends. Mini Khan is back with me now! I'm not sure when he'll be ready to travel again - it's been almost three years since he set out on his world tour - but you can follow his tweets to keep on his latest shenanigans. 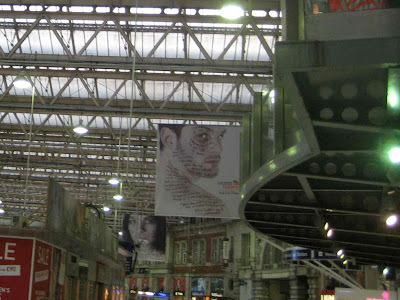 Upon finding myself in Waterloo Station, I thought I'd take a few pictures in honor of Jhoom Barabar Jhoom. My pictures barely show the same things as my screen caps, but you get the idea. The blue horizontal Waterlook sign between their heads is barely visible below the arc of the balcony on the right. Again, look for the big blue sign, in this case the trapezoidal one on the top left of the film still, which is center right in my snap. 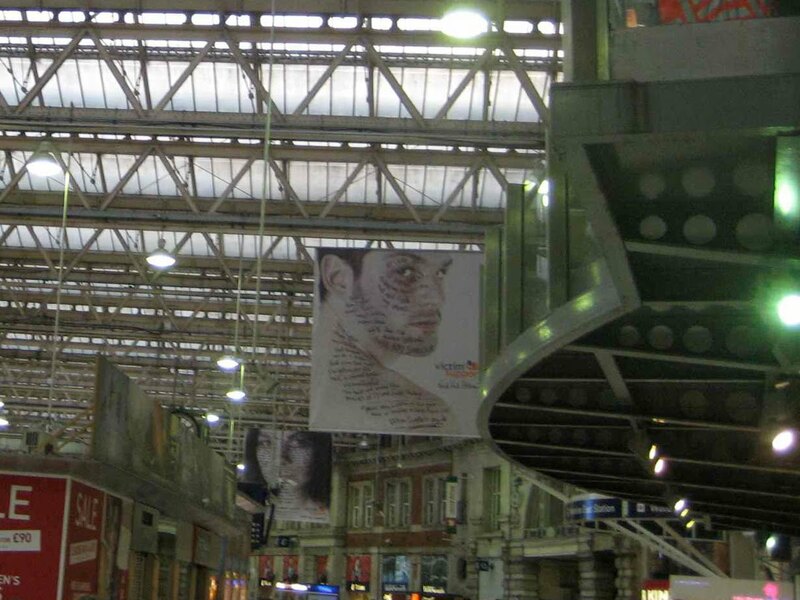 And yes, I did start singing to myself as I walked through. And no, Amitabh did not magically appear in his Willie Nelson/pimp/Steve Martin getup. Rishi Kapoor! In person! 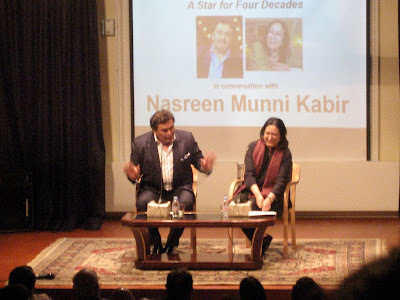 He did a public interview with Nasreen Munni Kabir at the Nehru Centre. Bollywood - and much other historical and contemporary Indian and British - imagery in the exhibit of the work of the Singh Twins at the National Portrait Gallery (and an additional work at the Museum of London). Click here to see some of their amazingly intricate and thoughtful paintings - and for a taste of their use of film culture, try Love Lost. I loved their works so much I bought an enormous hardback book about them at the NPG shop - and then, it must be said, had a nervy b in Oxford when I found out that it would cost more to mail the thing home than to buy it in the first place, which led to harsh self-rebuke over how much crap I was toting around. I was only consoled (and just barely) by a really good almond croissant. Fortunately one of my kind traveling companions offered to take the book home in her suitcase (she had only a week's worth of stuff versus my three, plus you've seen my writing and can easily imagine that I have a hard time packing light), which left room for Mini Khan and his accessories (talk about an inability to edit one's traveling wardrobe!). Spelunking through a stash of vintage Filmfare with film journalist/student and everyone's favorite white-guy extra of the new millennium, Steven Baker! Shall we ponder why Akshay Kumar is wearing a peach crushed velvet body suit in this picture from February 1998? No? I also hopped across to Germany to visit House in Rlyeh, who has the most extensive DVD collection I have ever seen. As is totally fitting, we watched Nagin, which I cannot WAIT to see again and screencap and write up, and he indoctrinated me into some wonders of other international cinemas, such as my very first El Santo film, El Santo vs. The Martians, the super groovy and hilarious Deathless Devil from Turkey, and two low-budget American...I don't know what to call these films - horror? sci-fi? - about aliens (Don Dohler's The Alien Factor) and swamp creatures (The Legend of Boggy Creek). Special thanks to kindred spirit Todd for keeping Interpol at the ready should I have gotten buried in DVDs or fallen into a Bigfoot/luchador/go-go-boot coma. Since returning from vacation, I took part in a quadrilateral podcast with Totally Filmi, Filmi Girl, and organizer/host Asim Burney of Upodcast. Once it's ready, we'll all post the link on websites and twitter. On the tail end of the long weekend (which I spent in Chicago but did not involve any movie shopping on Devon Avenue, o tragedy of tragedies), I got to have lunch with Bollywood Fangirl, HRH Pitu Sultan, and Paresh of the Curry Smugglers (the most fun "progressive desi music podcast" you might not be listening to yet). Topics of discussion included bad American 80s films, the cast of characters at Chicago-area desi events, favorite restaurants on Devon Avenue, and why Sanjay Leela Bhansali tires us. At this point, the following are officially old news, but for posterity, I'll just mention them quickly. 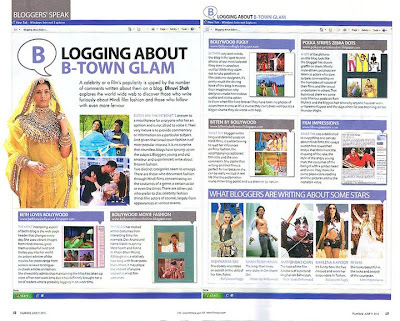 Two of the websites I write for (this one and Bollywood Fugly) got mentioned in Filmfare's hilarious article on sites that discuss Bollywood fashion (June 9 issue with Bipasha and John on the cover). Filmi Geek is posting again! New reviews include Shaan, Blackmail, and Ashanti, a.k.a. Bollywood Charlie's Angels. Yeah baby! In case you, like I, missed out on all the Govinda madness last month, you can catch up on Totally Filmi's Chichi Week with this list of all the related posts. I absolutely positively promise to write up Pyaar Karke Dekho really soon. Warning: its screencaps might cause seizures. Speaking of theme weeks, Rum has organized Shameful Pleasures Week, taking place RIGHT NOW, so take a deep breath and tell us all what you really watch. And next month, Sridevi is the star of honor in Bollystalgia's Sridevi Week, August 13-20. If you haven't been by Bollystalgia yet, may I recommend starting with her fantabulously epic list of Hindi film disco songs? Yep, kiss the next few hours goodbye. Phew! I hope to be back with actual posts on actual films later this week. Lunch was Fab!! I only wish we were able to hang out more often. It always feels so rushed. I am also insanely jealous of you other adventures but happy to have caught the tale end of Beth's Month-o-Fun. Next up...slumber party with you and HRH Pitusultan. Yay! Can't wait! I want to read the scanned article but the fonts are too small. Beth!!! I am SO glad you are back, you have been seriously missed but your adventures sound MAST yaar. I'm jealous, I've never been to Europe EVER. I admit, my idea of Europe might be walking around in a sari & sleeveless blouse and singing "Mitwa" from Chandni in Switzerland. And your mention in Filmfare is SO COOL. 'Bout time they started to appreciate your brilliance. Can't wait to hear the podcast too. Thank you thank you thank you for the mention, it's really sweet of you. I'm so glad you inspired me to start doing this, it's seriously addictive and I'm having a blast! Thank you so much for the shout-out, my dear, and I am glad you had such a delightful trip! HOORAY!!! Back to Bethy time fun! Oh Beth! Thank God you're back! I thought you had a serious accident or something! Ha ha! Funny thing that you mentioned the librarian-bollywood connection! I'm a librarian too, and I so wish to become a film-librarian someday (with the help of any of the bolly-Gods). Christy - it WAS!!! It went by in such a zoom - we got there and all of a sudden we all had to zip off again. Pout pout. I think the podcast will be really fun - if perhaps a bit long-winded. Your blog is a blast! I am so glad you started, my Chicago/Riseling/masala twin! Banno - Hurrah! Hope they pleased. I would love to know if you've seen any Turkish movies and what you thought. Amrita - You manage to say that despite knowing full well that the next films I write up are going to be Pyaar Karke Dekho and Nagin. Pasxalia - Never fear! :) Just having too much distracting fun to put pen to paper, as it were. And it is odd, isn't it, that Memsaab isn't a librarian? I think she missed her calling! And yes i've been pondering why Akshay is wearing a peach crushed velvet cat suit? Help!!!!! Yay!!! You are back!!! :D :D And after the most fun vacation EVER! You found vintage Filmfare - is it too much to hope that the vintage went back to 60s and 70s (and there was SHASHI in it)? And you SAW Chintu-ji up-close. You lucky LUCKY girl!!!! PS: Akshay is clearly wearing that suit 'coz he CAN! He is a STAR and it's not for us mere mortals to question his taste (or lack of it) in clothes. Rishi live. Sigh. Trip of a lifetime! By the way, I assume you're watching the Jeetendra Nagin? I may need to re-watch. Beware, it's what first hooked me on the Snake Cinema. "Let's start an elite commando unit that ferrets out obscure films and old copies of Stardust!" and mentioning bolly-archeology, what is the link for Sridevi week? Couldn't find it and I'm dying to take part. Cheers! Anarcahvist (1) - You would have LOVED IT. He was RIGHT THERE!!!! I wanted to hug him but then remind him that he wasn't really answering the questions and his answers sounded very pat most of the time. (2) Yep, that's the one! I think you should re-watch WITH ME. bollyviewer - The Filmfares went back to the 90s, so no Shashi. But never fear - that can be the Bollywood Librarians' first assignment! Anishok - Thanks! I'm glad to be home and back to my REAL life of Bolly nuttery. I'm not sure there is a link for Sridevi week yet - just some announcements on twitter about its dates. Sridevipalooza is Aug 13-20! And that's whats been keeping you busy!! Travels and further exploration into all things bollywood!! Tons of fun! Did you get to meet Rishi backstage?! That's really cool! Also, You and Steven Baker look like you guys upto no good ;) where did you guys score the vintage filmfare?! Glad to have you back & looking forward to the coming posts! Will hit you up when I'm in Chicago next... am gutted I missed the Southall trip, but that was the French chateau wedding weekend, methinks. 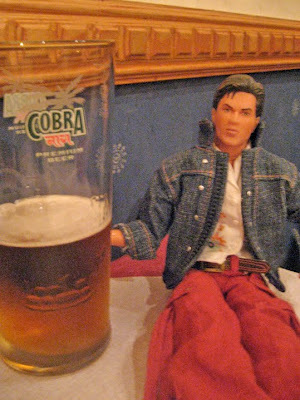 Ash - It was KRAZZY4 amounts of Bolly- and Bolly-friend goodness! The best way to travel. Steven is such fun to hang out with and so so knowledgeable about films and film culture. He did a great TedX presentation about his life as an extra. http://www.youtube.com/watch?v=p7Hivk259rc The Filmfares were actually in his university library (where they belong!) - he's doing a master's at the School of Oriental and African Studies at the University of London. TBS - It only took us, what, 4 years or so? Do you actually ever make it to Chiacgo? I hope so! I am there in a heartbeat if so. Devon Avenue is not quite as chockablock with goodies as Southall but it will do in a pinch - and traffic will definitely stop if we need to do our dance number across the street.